Sarah has worked for a major grocery store chain for the past 25 years. Adjusting for inflation, she makes less now than she did over a decade ago, especially since her hours were cut in order for her employer to avoid being required to offer her health insurance. Even more difficult, she is “on call” most of the week, without a reliable schedule, which makes it impossible for her to take on a 2nd part time job to help make ends meet. Including benefits, Sarah is lucky to make $30,000 per year. Now in her early 50s, she will need to work for as long as there is strength left in her body to do the job. George works for a fire department serving an affluent suburb on the California coast. Taking into account the vacation time he earns as a 25 year veteran, he works less than two 24 hour shifts per week before qualifying for overtime. Since five-day weekends are overkill, he often works one or two extra shifts a week, doubling his pay. When he goes on calls, 98 percent of the time they are medical emergencies, not fires. Including moderate amounts of overtime and the employer’s payments for his benefits, George makes about $250,000 per year. Now in his early 50s, he will retire in a year or two and collect a pension and health benefits package worth well over $100,000 per year. Both of these individuals are hard working, honest and conscientious. Both of them perform jobs that have a vital role to play in our society. Both of them deserve to be treated with dignity and respect. Neither of them wrote the rules. And both of them are represented by unions. While these individuals and the work they do is beyond reproach, the unions that represent them leave much to be desired. In Sarah’s case, typical of tens of millions of private sector workers, the unions who represent her have ignored economic reality in pursuit of ideological fantasies. Almost universally, to cite a particularly wounding example, these private sector unions have supported immigration policies that increase the supply of semi-skilled workers who compete with Sarah for work hours. Also common are the pragmatic alliances these unions form with extreme environmentalist organizations who have bottled up development of land and energy, driving the cost of living beyond the reach of an ordinary worker. One may cogitate endlessly over what constitutes optimal and humane policies with respect to immigration and the environment. But to agitate for higher wages and benefits in a society awash in cheap labor and artificially inflated costs for basic necessities is a fool’s errand. In George’s case, which is equally typical, at least in California, the unions that represent him should not even be permitted to exist. Associations of government workers who engage in collective bargaining are not unions in any traditional sense of the word. They elect their own bosses, they take money from taxpayers instead of competing for consumer spending, and they operate the machinery of government which lets them intimidate or co-opt any special interest that might oppose them. They have priced normal government services beyond the capacity of ordinary taxpayers, and bred cynicism about government into the heart of any financially literate American. And government unions have even less interest than private unions in acknowledging the complexity of issues such as immigration or environmentalist overreach. In both cases, policies that harm the aspirations of private workers have the opposite effect on them, enhancing their job security. A legitimate labor movement is easy to justify in the abstract. If not unions, what sort of movement will speak for ordinary workers in an era when jobs are being relentlessly automated, global competition is tougher than ever, and the cost of living is punitive? What sort of movement can speak for ordinary workers if, along with these challenges, the nation is gripped by a deep recession brought on because interest rates can’t go any lower and stimulative debt can’t go any higher? The reality today is that much of America’s labor movement has gone astray. Private sector unions often put ideological goals ahead of the economic interests of their members. And public sector unions, which are not unions in any traditional sense of the word, and which represent the economic interests of their members all too well, are an abomination. They have corrupted our democracy, they are a corrupting influence on government workers because they have exempted them from the economic challenges facing private American workers, they are driving our governments at all levels towards authoritarianism, they are bankrupting our cities and counties and states, and the pension funds they control epitomize the most corrupt elements of America’s grotesquely overbuilt financial sector. Maybe what would remain after abolition, still very powerful voluntary associations, could start fighting for CEQA reform, for example, to benefit all workers instead of just themselves. Before unions infested our governments, that’s what public service meant. Envisioning exactly how the labor movement might best operate in the interests of the American worker is difficult but necessary. It requires balancing libertarian and mixed-capitalist economic world views. But two reforms would be a very good start. First, outlaw collective bargaining in the public sector. Second, the leaders of the private sector labor movement need to starting caring more about American workers, and less about their elitist ideological fantasies. 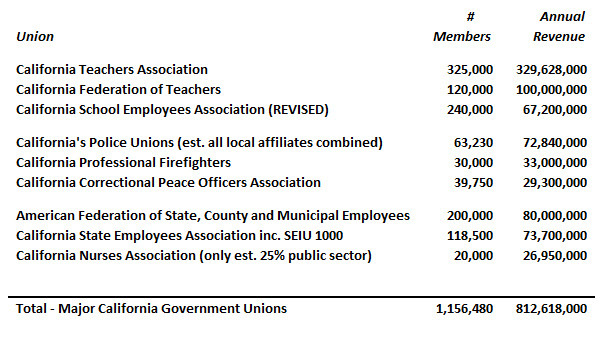 California’s public sector unions collect and spend well over $1 billion per year. When you have that much money, you can hire thousands of skilled professionals to wage campaigns, litigate, lobby, negotiate and communicate. You can hire the best public relations firms money can buy. You can commission research studies that spin facts to support your agenda. You can silence voices of dissent, voices of reason, voices of reform, with an avalanche of misinformation. And it works. Here, then, for what it’s worth, is a “top 10” list of some of the biggest deceptions and misleading claims made by California’s government unions. 1 – Government unions are protecting the middle class. FALSE. Government unions are protecting government workers at the expense of the private sector middle class. The agenda of government unions is more wages and benefits for government workers, and more hiring of government workers. To adhere to this agenda, failure of government programs still constitutes success for these unions. More laws, more regulations and more government programs equates to more unionized government workers, regardless of the cost, benefit or need for these programs. The primary agenda of unionized government has nothing to do with the welfare of the private sector middle class, whose taxes pay for it. 2 – Government unions are a necessary political counterweight to “Wall Street,” big business and billionaires. FALSE. When government is expanded to serve the interests of government unions, the elite and privileged special interests are relatively unaffected, and often benefit. Large corporations can afford to comply with excessive regulations that drive their emerging competitors out of business. When governments borrow to finance deficits created by an over-built unionized government, bond underwriters profit from the fees. Government pension funds are among the biggest players on Wall Street, aggressively investing hundreds of billions each year to secure their 7 percent (or more) per year returns. Billionaires can afford to pay taxes and fees – it’s the middle-class taxpayer who can be overwhelmed by them. When powerful special interests want favorable legislation passed in California, they go to the government unions and make a deal. Government unions are the brokers and enablers of special interest cronyism. They are allies, not counterweights. 3 – Government unions represent and protect the American worker and the labor movement. FALSE. For better or worse, government unions represent and protect government workers. Government unions and private sector unions have very little in common. Unlike private unions, government unions elect their own bosses, and their agencies are funded by compulsory taxes, not through profits earned by creating products and services that are voluntarily purchased in a competitive market. Moreover, government union members operate the machinery of government, giving them the ability to harass their political opponents under cover of authority. Private sector unions – properly regulated – have a legitimate role to play in American society. Government unions, on the other hand, exist to serve the interests of government workers, not the ordinary American citizen. 4 – Public employees are underpaid. FALSE. In past decades, prior to the unionization of government, a public worker exchanged lower base pay for better retirement benefits and more job security. But today, not only have retirement benefits been greatly increased from what was normal back in the 1980’s and 1990’s, but in most cases the base pay of government workers exceeds the base pay for private sector workers performing jobs requiring similar skills. A 2015 study by State Budget Solutions estimated the total compensation of California’s government workers to exceed private sector workers by 31 percent. But these studies typically omit lower paid independent contractors who now constitute one in three workers. A California Policy Center study that examined 2012 data showed the average pay and benefits for California’s city workers was $124,058, county workers $102,312, and state workers $100,668. And this study did not take into account the value of additional paid vacation benefits, extra paid holidays, and generous “comp time” policies, which add significantly to the total value of annual compensation. Just how much public employee pay exceeds private sector pay for equivalent jobs is the topic of ongoing debate. But they’re not underpaid by any reasonable measure. 5 – The average public sector pension is only $25,000 per year (or some similarly low number). 6 – California’s state/local pension systems are being reformed and will be just fine financially. FALSE. Virtually every official post-reform projection among California’s 80+ public sector pension systems are predicting eventual financial health based on a huge, extremely risky assumption – that the average annual returns of these funds over the next few decades will exceed 7.0 percent per year. Common sense should tell any unbiased observer that ongoing 7.0 percent average annual returns are not a safe bet. If they are, why are Treasury Bills only yielding 3.0 percent? What are mortgage bankers only able to get 3.5 percent on 30 year fixed mortgages? Why are bank CD’s only offering 2.0 percent? The spread between equity returns and truly risk-free returns has never been this large for this long. Pension funds are basing future performance projections on past results. The problem is that over the past 30 years, interest rates have been steadily lowered to allow people to borrow more. This borrowing stimulated the economy, creating corporate profits and driving up the price of corporate equities. But interest rates cannot be lowered any further. We are at the end of a long-term credit cycle, and pension funds are just beginning to deal with the consequences. 7 – The teachers unions care about student achievement more than anything else. FALSE. The evidence simply doesn’t support this assertion. Consider the reaction of the California Teachers Association to the recent Vergara decision, in which a Los Angeles superior court judge agreed with student plaintiffs who challenged three union work rules. The CTA criticized the ruling and announced their support for an appeal. What does the Vergara lawsuit aim to accomplish? It would take away the ability for teachers to earn tenure in less than two years. It would end the practice of favoring seniority over merit when deciding what teachers to layoff. And it would make it easier to fire incompetent teachers. These are commonsense, bipartisan reforms that the teachers unions oppose. 8 – Billionaires are trying to hijack California’s public education system. FALSE. To the extent wealthy individuals have decided to involve themselves in education reform and private education initiatives, they come from a diverse background of political orientations. But all of them share a desire to rescue California’s next generation of citizens from a union monopoly on education. And unlike the unionized traditional public school, public charter schools and private schools survive based on the choice of parents who want a better education for their children. And if they don’t do a great job, the parents can withdraw their children from the failing charter or private school. Introducing competition to California’s unionized K-12 education system is a healthy, hopeful trend that gathers support from concerned citizens of all incomes, ethnic groups, and political ideologies. FALSE. This sort of claim is a distraction from the reality – which is that public sector unions have corrupted the democratic process and have been attempting to inculcate public employees with the “us vs. them” mentality that is the currency of unions. Sadly, the opposite is the truth – government unions alienate the public from their government, and, worse, alienate government employees from the public. They have created two classes of workers, government employees who have superior pay, benefits, job security and retirement security, and everyone else in the private sector. They know perfectly well that this level of worker comfort is economically impossible to extend to everyone. Government unions have undermined the sense of common rules and shared fate between public and private individuals that is a foundation of democracy. Those who oppose government unions recognize this threat. It has nothing to do with their support and respect for the men and women who perform the many difficult and risky jobs that are the role of government. FALSE. The problems caused by government unions should concern everyone, and they do. Conscientious left-wing activists who favor an expanded role for government expect positive results, not failed programs that were created merely to increase union membership. They realize that unionized government is expensive and inefficient, leaving less money or authority to maintain or expand government services: Public libraries and parks with reduced hours and curtailed maintenance; pitted, congested roads; after school recreation programs without reliable funding; public schools where students aren’t learning and apathetic teachers are protected from accountability. Government has to be cost-effective, no matter how big or how small. Opponents of government unions can disagree on the optimal size of government, yet passionately agree on the problems caused by a unionized government. This list of 10 myths promulgated by spokespersons for government unions only begins to chronicle their many deceptions. But each of these myths offer strategic value to these unions – giving them the ability to put reformers on the defensive, change the topic of discussion, redefine the terms of the debate. Each of them has powerful emotional resonance, and each of them – along with many others – is continuously reinforced by a network of professional communicators backed by literally billions in dues revenue. Compensation reform, pension reform, other fiscal reforms, reforming work rules, education reform – all these urgent reforms must first go through one powerful special interest that stops them in their tracks: Government unions. Reformers must confront not only the myths these unions promote, challenging and debunking them, but they must also redefine the role of government unions, if not question their very existence. The 2014 mid-term elections will be remembered for many things – pioneering use of information technology to comprehensively profile and micro-target voters, escalating use of polarizing rhetoric, historically low levels of voter turnout, and historic records in total spending. In California, in spite of all this money and technology – or perhaps because of it – the political landscape is probably not going to change very much this time around. But appearances can be deceiving. While Democrats will still control California’s state legislature and nearly all of California’s large cities and urban counties, new fault lines are forming within California’s electorate that defy conventional definitions of Republican and Democrat, or conservative and liberal. Because as it is, California’s schools are failing, businesses and middle-income residents are fleeing, and the cost of living is the highest in America. Three powerful groups benefit from and perpetuate this arrangement with their money and their votes: Wealthy individuals and crony capitalists, unionized public sector workers, and low-income residents who have become entirely dependent on government and are susceptible to their rhetoric. The terms of this alliance are financially unsustainable and even now, they harm low income residents more than they help them. It will crack as soon as a viable opposition coalesces. And that is happening. (1) Financial sustainability is a bipartisan issue. California’s cities and counties, despite revenues from an unsustainable asset bubble that has bought them time, are on a collision course with financial insolvency. This reality has already confronted every big city mayor in California. Some, including Democrats like San Jose’s courageous mayor Chuck Reed, are trying to enact reforms to save their cities. Over 80% of the non-federal government spending in California is at the local level, and sooner or later, liberals and conservatives are going to join together to demand realistic financial reforms to restore financial health to California’s public institutions. (2) Quality public schools is a bipartisan issue. California’s public schools will not be improved by spending more money, they will be improved by making fundamental reforms to how schools and school districts are managed. The Vergara lawsuit, funded almost entirely by conscientious Democrats, proves how committed everyone is to restoring accountability to public education. The success of charter schools proves that superior educational outcomes can be had for less money than is currently made available to public schools. (3) The mission of public sector unions is inherently in conflict with the public interest. Both of the examples just mentioned – quality education and financial health – are the priority of any civic minded private citizen, but are not the priority of the public sector unions who control California politics. The reason California’s schools are failing is because of union work rules that prevent innovation and accountability. The reason California’s government finances are perennially challenged is because for decades, public sector unions have pressured politicians to grant pay and benefit increases that have become unfair and unaffordable. (4) Private sector unions are fundamentally different from public sector unions. The growing rift within Democrats, and the growing consensus among all California voters, is based on a fundamental fact: Criticizing, or even abolishing, public sector unions does NOT represent an attempt at a broader war on labor, working people, or private sector unions. There are serious issues relating to the role and optimal regulations for private sector unions, but they play a legitimate, vital part in American society. Public sector unions, on the other hand, should be abolished. (5) No party, platform, or person has all the answers. This is not a new reality, but today in California it is being increasingly recognized by reformers across the political spectrum. And there is a new, unifying theme – the need for public sector union reform, fostered through education reform and fiscal reform. While politicians and citizens may disagree over the size of government and the role of government, they are agreeing, more than ever, that government unions have skewed this debate and taken options away. Can we improve and enhance government services, or invest in ambitious new infrastructure projects? No, because tax revenue must pay over-market compensation to government workers. Can we streamline and modernize a government agency or effectively manage a school? No, because of union work rules. New coalitions are forming that will not accept failing schools, or cities and counties in a perpetual state of financial crisis. They will fight together for educational excellence and fiscal health. And because nothing matters more than our children and our ability to earn a living, they will recognize the unpleasant truth – to restore public education and public finance requires fighting public sector unions. In California, the outcome of the 2014 election is sadly predictable. But change is coming.